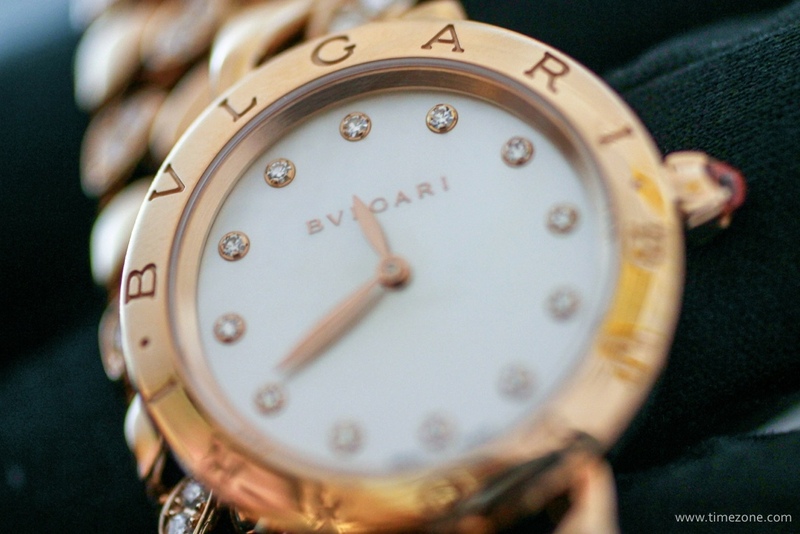 Our friends at Bulgari provide TimeZone with this exclusive hands-on look at their new ladies timepieces, including the new BVLGARI BVLGARI Catene bracelet watch, two sensual additions to the iconic Serpenti Collection, and three boldly designed complications. 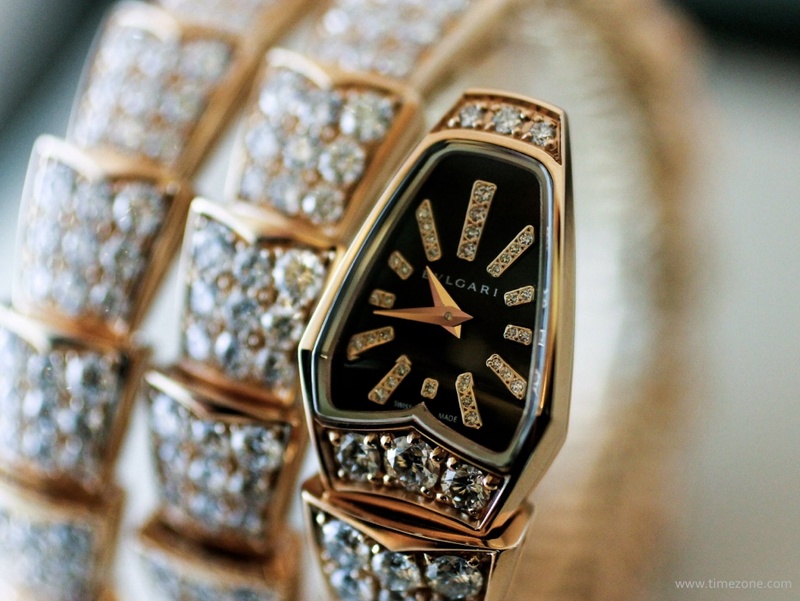 Popularised in the 1970s, the BVLGARI BVLGARI collection is distinguished by a bezel engraved with a double logo of the family’s name as a graphic. 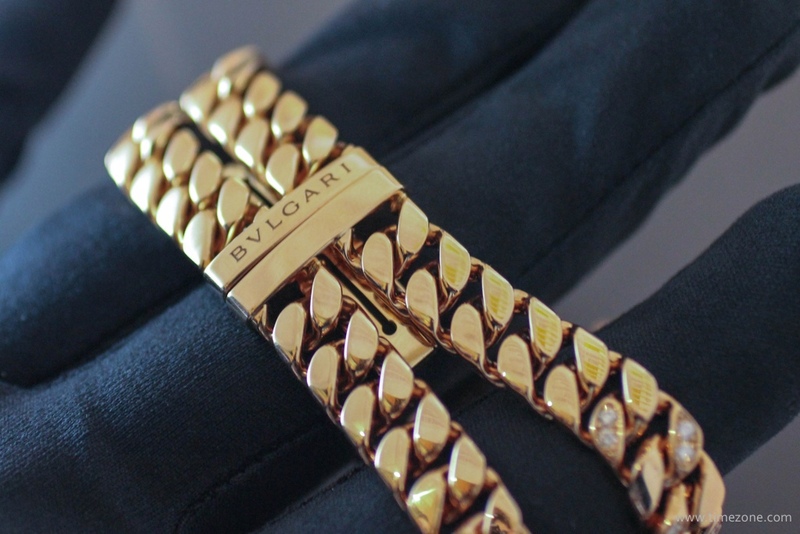 Playing off this signature design cue, the new BVLGARI BVLGARI Catene is a double chain link bracelet watch crafted in solid 18-carat pink gold and gem-set with 60 brilliant cut diamonds. The bracelet, alone, weighs a substantive 140 grams (~4.9 ounces). 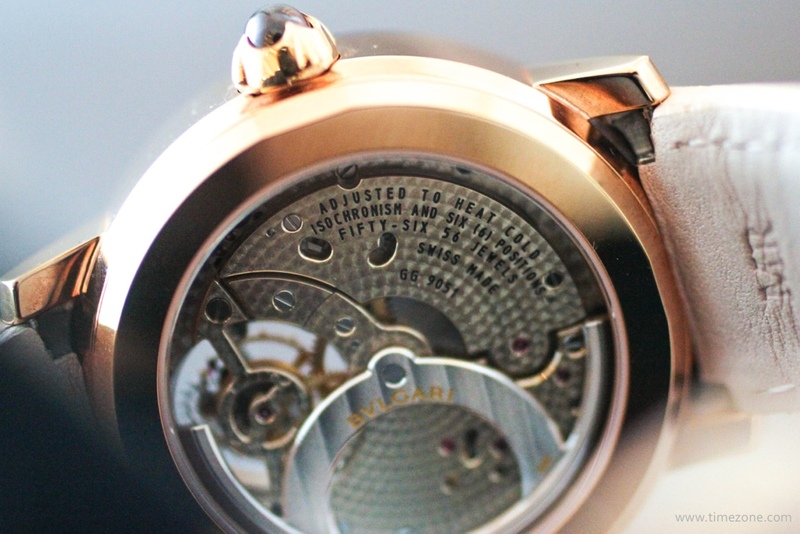 The 31mm pink gold case frames a white mother of pearl dial with twelve diamond hour markers. The case weighs an additional 31.08 grams (~1.1 ounces). 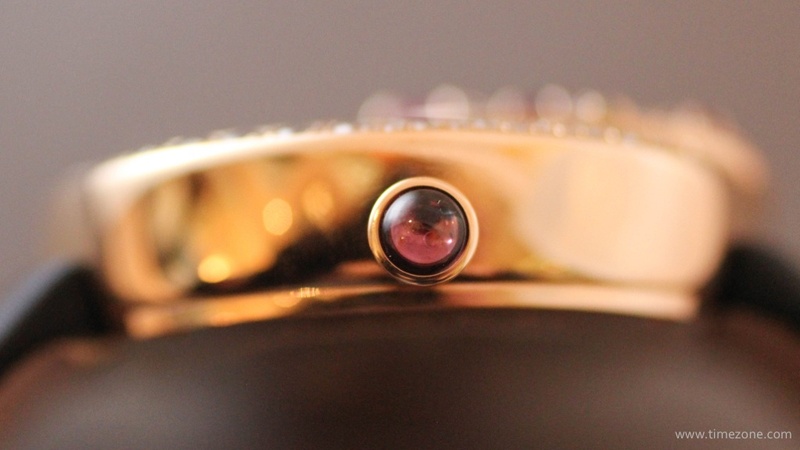 The crown is set with a pink rubellite. Tthe snake motif of the Serpenti coiled bracelet watch represents everything from birth, rebirth, beauty, sexuality and wisdom in Greek mythology and Roman civilisation. Elizabeth Taylor famously wore her Bulgari Serpenti while filming Cleopatra in 1962 and, in 2011, it auctioned for nearly $1 million at her estate sale. 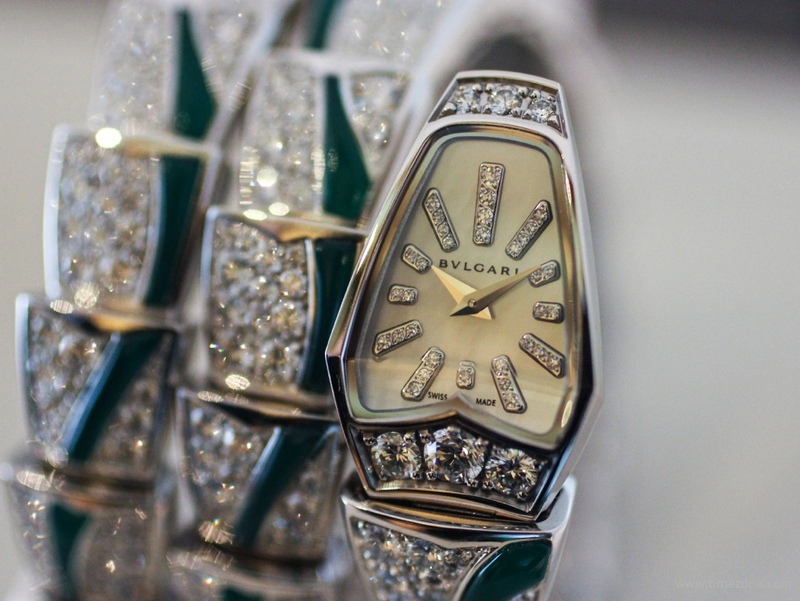 For 2013, Bulgari continues the legacy of its most emblematic timepiece with the addition of two jewellery models. 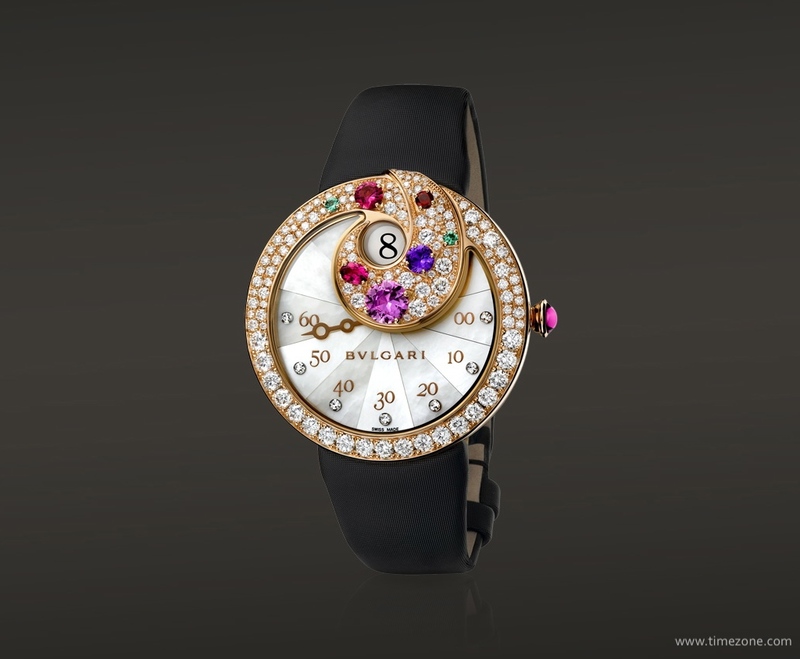 One features an 18-carat pink gold case set with brillant-cut diamonds, a black sapphire dial and a two twirls bracelet gem-set with brilliant-cut diamonds. 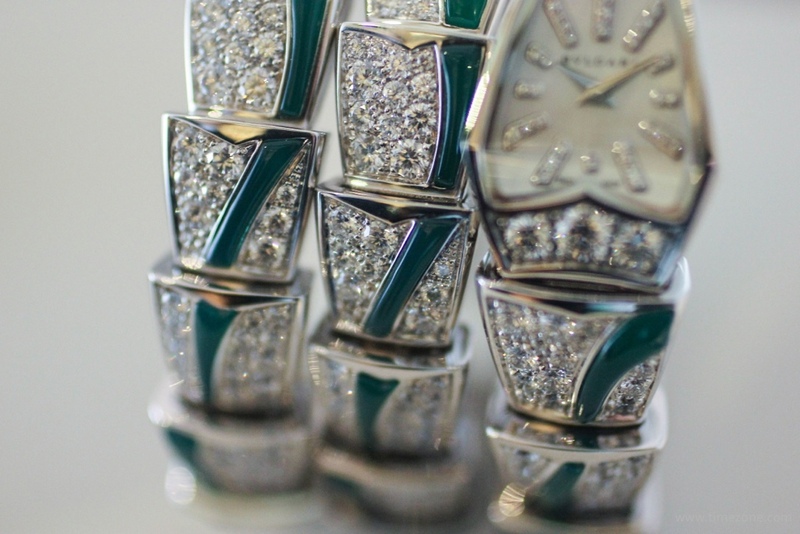 The other features an 18-carat white gold case set with brilliant-cut diamonds, a white mother of pearl dial and a two twirls bracelet gem-set with brilliant-cut diamonds and agate. 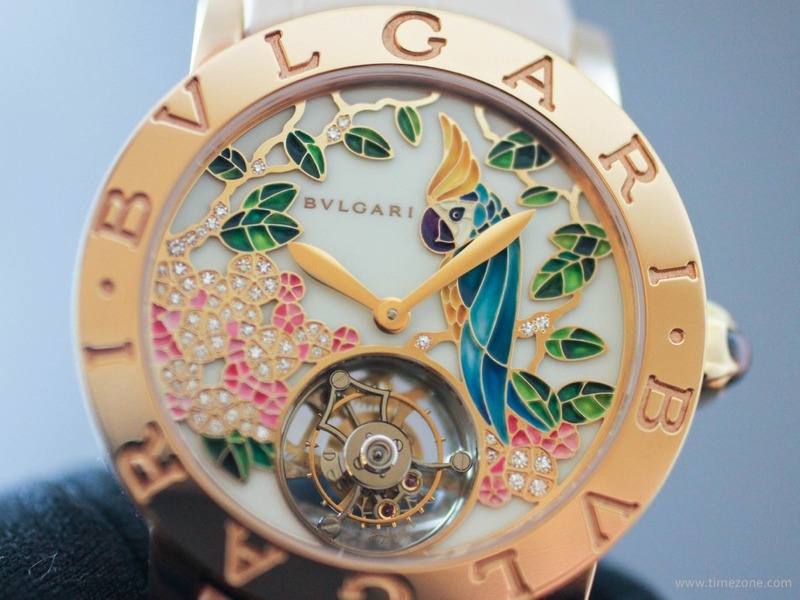 Il Giardino Tropicale di Bulgari is Bulgari’s first tourbillon designed and created for ladies. 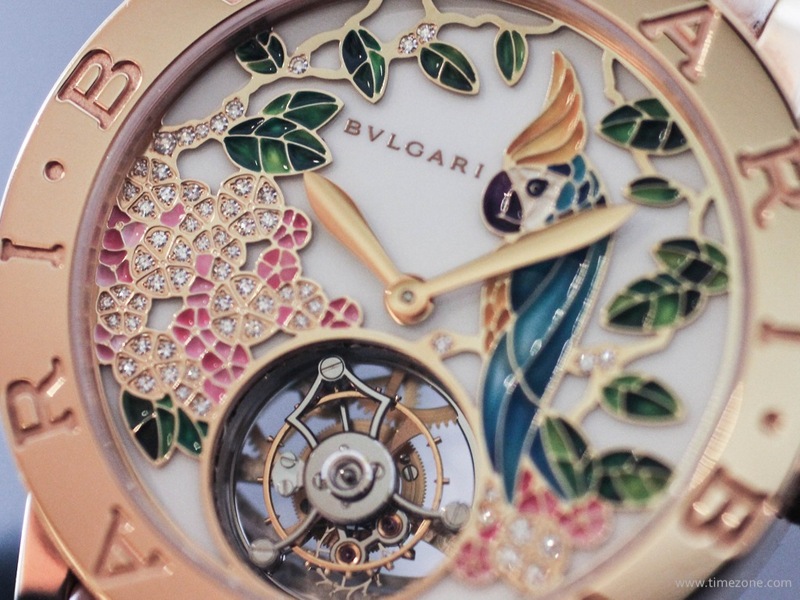 The champlevé enamel dial is crafted using a number of mastered techniques. 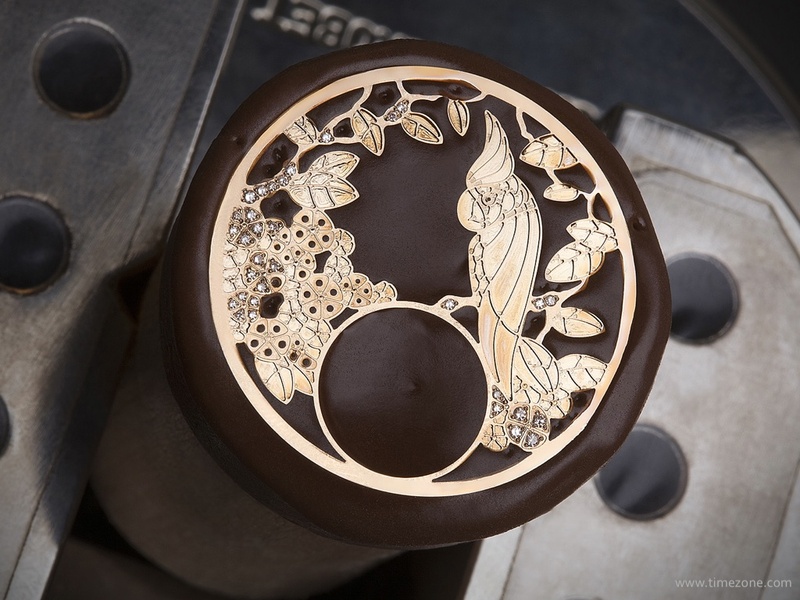 First, the tropical design is carved into a gold base. Then, a master gem-setter sets brilliant cut diamonds into some of the flower petals and branches. Next, a master enameller fills the cavities with moist powdered enamel. Three layers of enamel are applied for the flowers, five layers for the leaves and eight layers for the parrot. After each layer is applied, the dial is cleaned and fired in a kiln. A single dial may require up to 25 kiln firings. 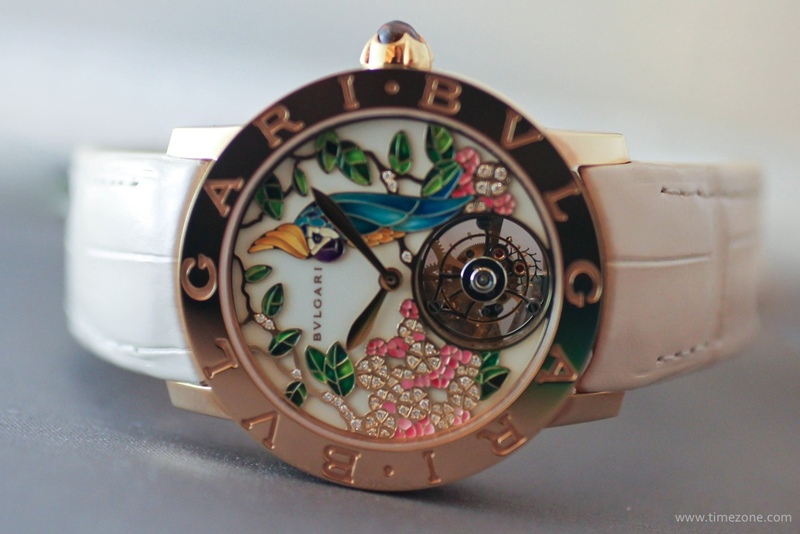 Finally, after polishing, the tropical enamel design is set onto an ivory lacquer base dial. 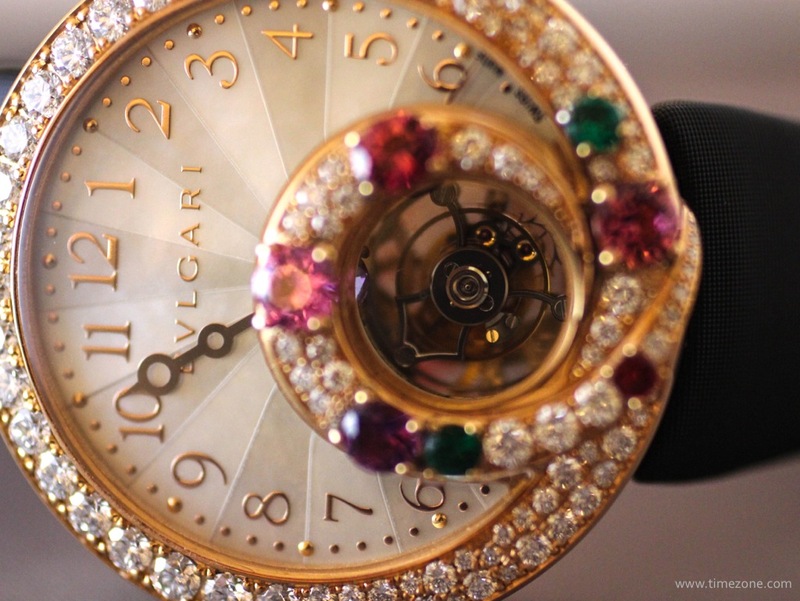 The colourful dial is framed by a 37mm 18-carat pink gold case. The timepiece is fitted with a 56-jewel Calibre GG 9051 automatic movement with a Tourbillon mounted on a sapphire crystal bridge. Production is limited to just 50 pieces. 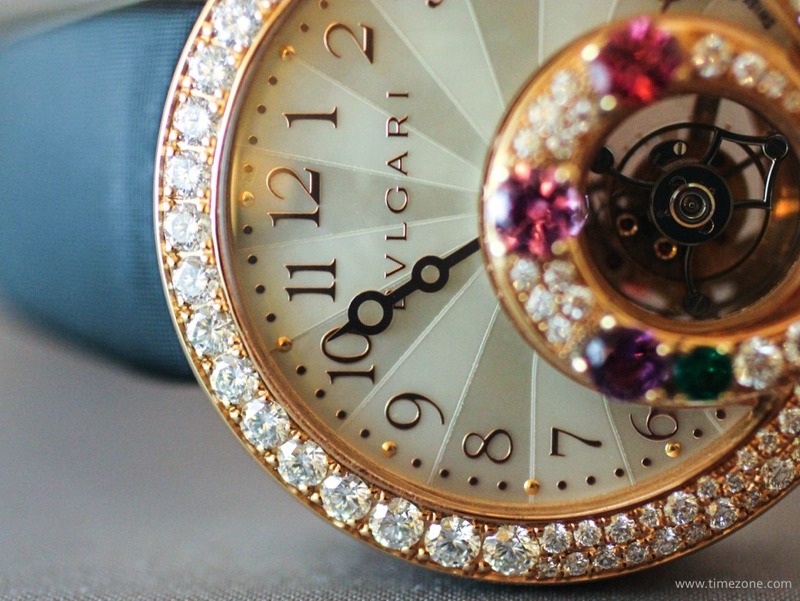 Bulgari’s signature jewellery style mixes heavy gold with large vibrant gemstones, and its new Berries timepiece collection is a perfect reflection of this audacious style. 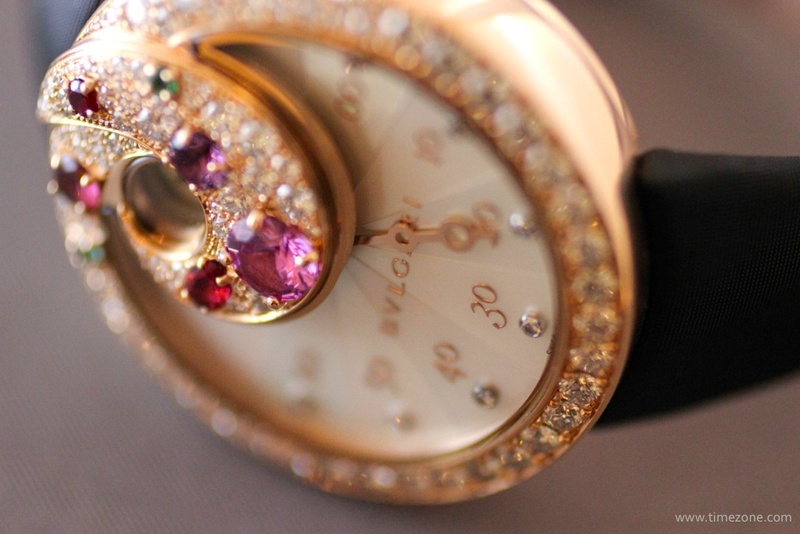 The Berries Jumping Hours and Retrograde Minutes is a jumping hours timepiece with retrograde minutes. 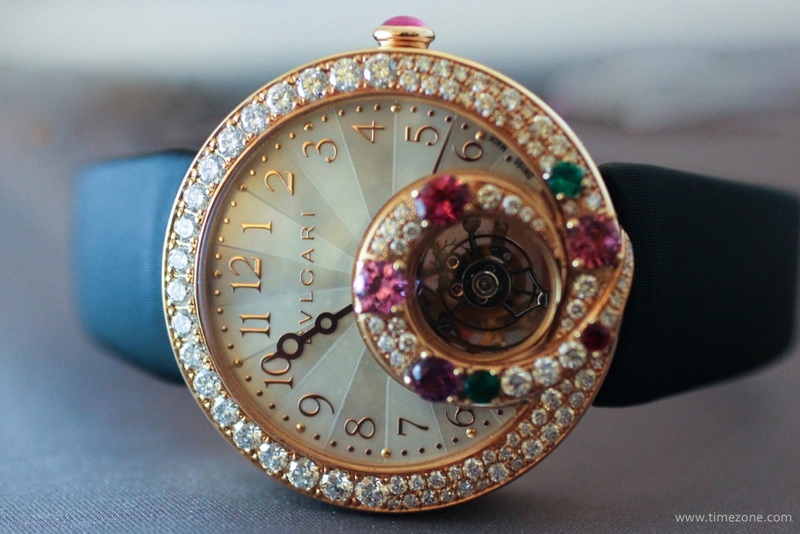 The 40mm 18-carat pink gold case is gem-set with 133 brilliant-cut diamonds and 7 colored gemstones, including two emeralds, two tourmalines, one sapphire, one ruby and an amethyst. 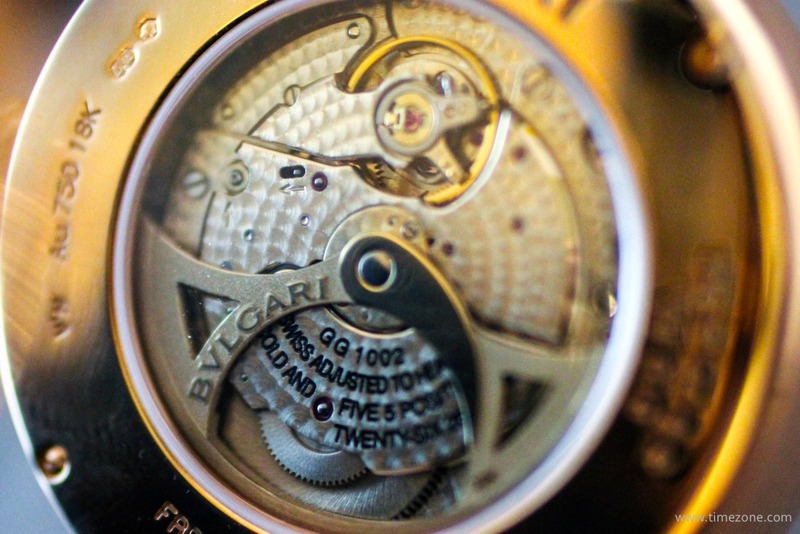 The timepiece houses a 26-jewel Calibre GG 1002 automatic movement with 45-hour power reserve. 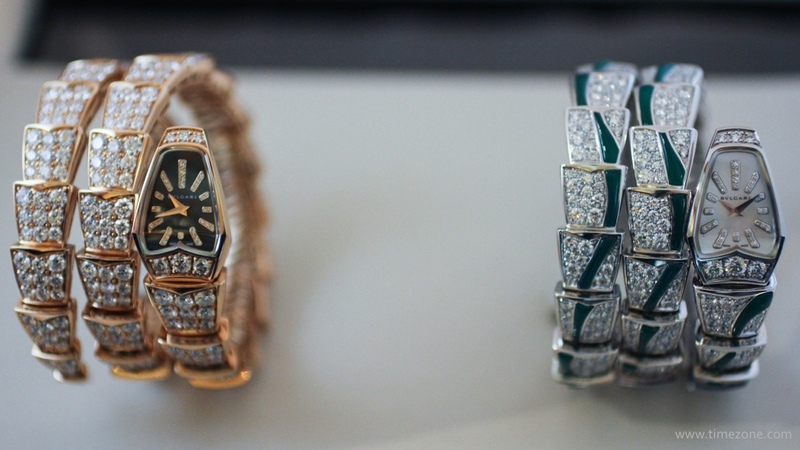 The jumping hours are framed by diamonds and gemstones. At the end of every hour, the minutes hand instantly jumps 180° from the left side 60 to the right side 00. The white mother of pearl marquetery dial is formed by 10 symmetrical segments. 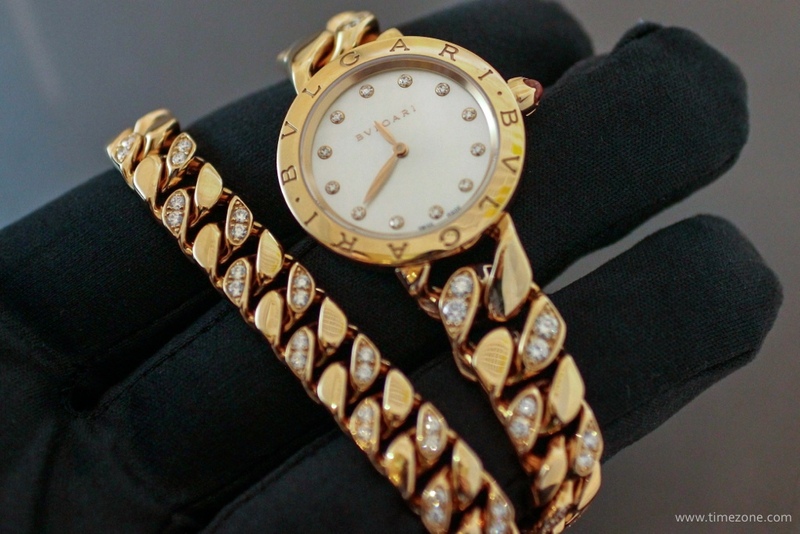 The satin strap is fitted with an 18-carat pink gold deployment clasp set with 28 diamonds. 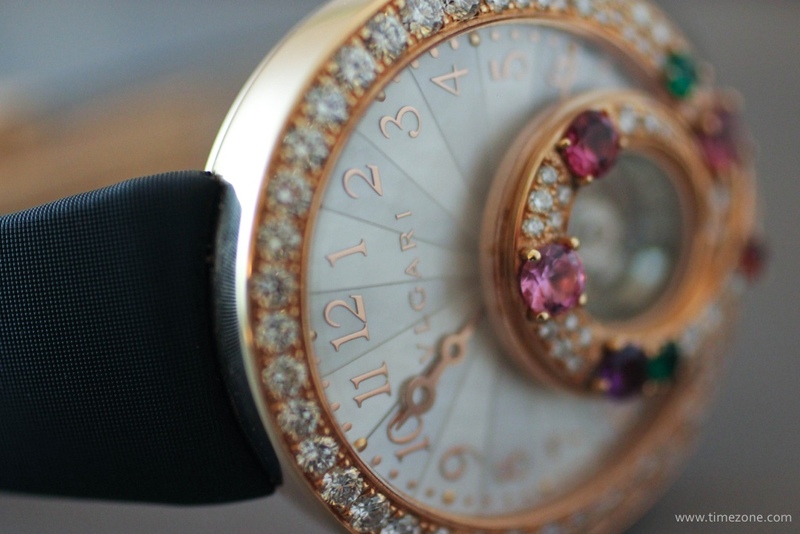 The Berries Tourbillon Retrograde Hours is a retrograde hours timepiece. 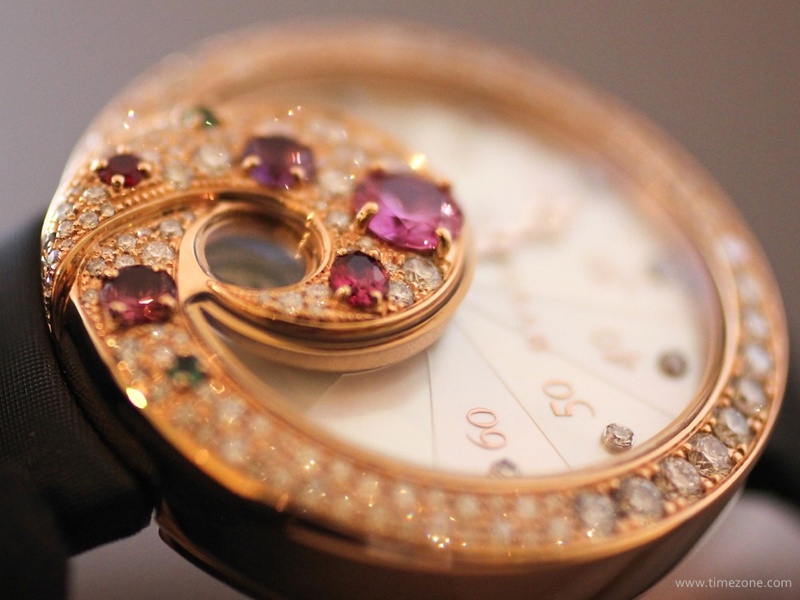 The 40mm 18-carat pink gold case is gem-set with 63 brilliant-cut diamonds and 7 colored gemstones, including two emeralds, two tourmalines, one sapphire, one ruby and an amethyst. 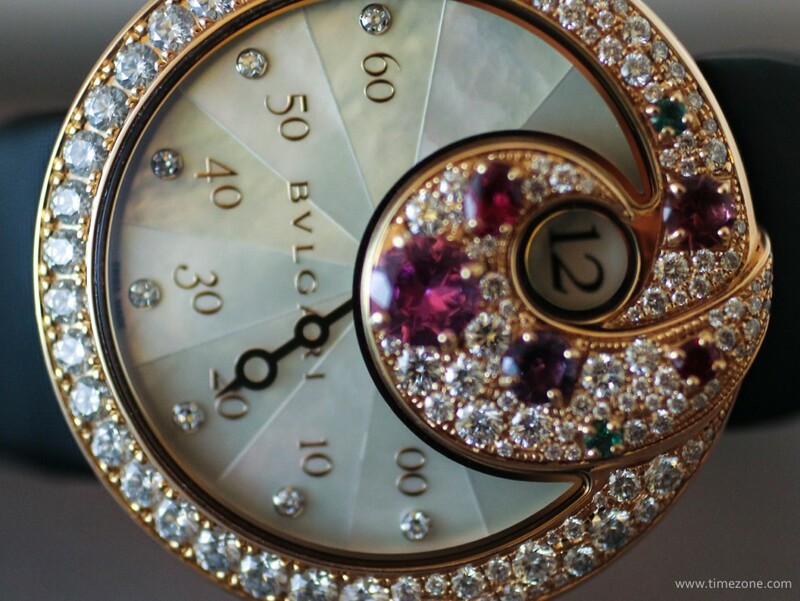 The white mother of pearl marquetery dial is formed by 15 symmetrical segments. At precisely 6 o’clock, the retrograde hours hand jumps instantly 240° from the right-side 6 to the left-side 6. Meanwhile, the minutes hand rotates clockwise. The timepiece houses a 56-jewel Calibre BVL 313 automatic movement with a Tourbillon mounted on a sapphire crystal bridge. 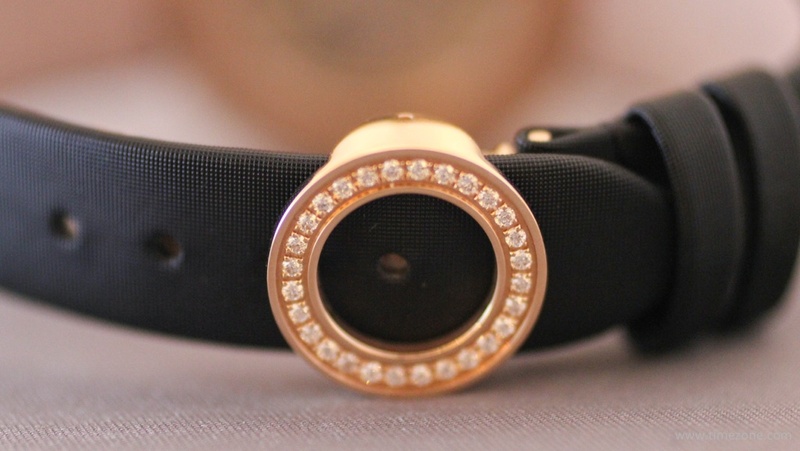 The satin strap is fitted with an 18-carat pink gold deployment clasp set with 28 diamonds. Production is limited to just 25 pieces.